Once a prominent region of Mughal of Delhi, Dhar is now one of the most popular tourist destinations of Madhya Pradesh, visited by thousands of tourists every day. This captivating city used to be the capital of Malwa until Mandu became a prime centre. Packed with amazing tourist attractions such as forts, ancient structures, old temples & mosque, waterfalls, and streams, Dhar lure tourists with its architectural wonder and stunning natural beauty. People often plan their trip to Dhar to enjoy its remarkable surrounding comprising barren hills, old ramparts, and historical buildings. With more and more tourists getting attracted towards this place, tourism in Dhar is picking up height. It is offering people an enjoyable and appreciated atmosphere to spend their holidays in the most blissful manner. Dhar is located around 53 km away from Mhow and is 908 feet above sea level; its cultural and historical splendor leaves tourists astonished and delightful on the same hand. 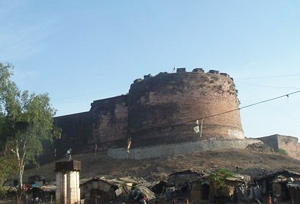 The Dhar town was founded by the Parmar King Bhuj, who ruled the town in the 11th century. Unfortunately, the king had to leave the city after defeats in several battles against enemies, but the members of his dynasty conquered the town back again in the year 1732 and ruled Dhar for a long time. Dhar is ruled by several rulers, including Sultans of Delhi during the Mughal Period and it was their prime centre till the revolt of 1857 happened. There are so many places that make Dhar an interesting destination to visit and one such place is Bhoj Shala, which is actually a mosque, but is termed as Bhoj Shala because King Bhoj, who built this structure, was the great lover of literature. He was also an author of a number of works on poetics and literature, and some of his inscriptions are engraved on the walls of the building. Lath Masjid and Bagh Caves are other popular destinations in Dhar that offers amazing experience to the tourists, who visit the town from around the world. Other popular attractions that tourists may visit during their holidays in Dhar includes Tomb of Shaykh Changal, Kamal Maula Campus, Cenotaphs and Old City Palace, Jhira Bagh Palace, etc. There are not many markets in Dhar, but if you really want to buy something, a few local markets and bazaars sell handicrafts and artifactsm including beautiful beadwork, bagh prints, Pithora paintings, gatha stones, leather & metal articles, and teak woodwork. By Air: The nearest airport is Devi Ahilyabai Holkar National Airport in Indore, which is around 64 km away from Dhar. The airport has good connectivity with other major cities like Delhi, Mumbai, Ahemdabad, Kolkata, Nagpur, Bangalore, and Hyderabad. Tourists can easily avail a taxi or a cab from this airport to reach their desired destination in Dhar. By Rail: The nearest railway station that connects Dhar to rest of the country are located in Ratlam and Indore. These two stations are further connected to cities like Mumbai, Pune, Nagpur, Delhi, Jaipur, Ahmedabad, Vadodara, Howrah, Bhopal, Ujjain, Gwalior, Bhind, Jabalpur, Bilaspur, Khandwa, Lucknow, Varanasi, Patna, etc. There are frequent taxis and buses from the railway station to reach Dhar. By Road: Dhar is very well connected to other major cities like Indore, Jabalpur, Gwalior, Bilaspur, etc. and there are regular buses from these cities to reach Dhar . Best Time to Visit Dhar can be best visited in the winter i.e. in the months between October and March, when the climate is pleasant and nice and the atmosphere refreshing. A lot of tourists visit this historical destination during this time to enjoy the interesting attractions and stunning natural sights like waterfalls and streams.